NEW YORK, Dec. 4, 2018 /PRNewswire/ — JCJ Architecture today announces the firm will design a groundbreaking new project for Barrier Free Living (BFL), a leading NYC community nonprofit that provides services and support for survivors of domestic violence with disabilities. The $30 million project is anticipated to break ground in Fall of 2019 with completion planned for January 2021. The building will challenge assumptions about the aesthetics associated with supportive housing and create a more direct and engaged relationship for residents with the surrounding environment. 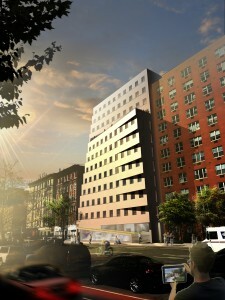 The new facility is intended to efficiently serve the needs of BFL’s clients, to provide a sense of pride, place and home for residents, and to create a unique architectural presence in the rapidly changing neighborhood where the East Village and Lower East Side converge. Inspired by the parameters of Mayor de Blasio’s Housing NYC Plan, this project will provide affordable housing and support services for a grossly underserved population. The project team will work alongside agencies and stakeholders including NY State Home and Community Renewal, ESSHI and NY City Board of Standards & Appeals. Funding for related services and rent support will come from the Empire State Supportive Housing Initiative.